« What’s a Nice Vegetable Like You Doing in a Batter Like This? Sometimes I find it hard to recognize my childhood memories as being about the real me. I have no trouble recalling the loquaciousness, the adorability, or (I admit it!) the mule-like stubbornness of the young Tinky. Nevertheless, it’s hard to believe that I spent my earliest years disliking some of the foods I now adore. I thought spinach was bitter and ugly. And I was determined not to eat rhubarb in any form. Today I’m thrilled to see fresh spinach at a farmstand. I long for Chinese food regularly. Rhubarb represents my biggest conversion. Rhubarb is probably my favorite fruit. Don’t bother to tell me that it’s not really a fruit. I know. We treat it as a fruit, however. 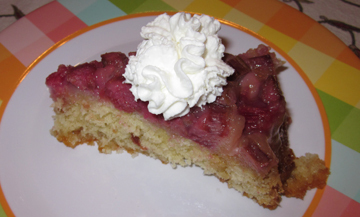 Today I am happy to post my first rhubarb recipe of this spring, courtesy of Sue Haas of Seattle, Washington, a regular reader of this blog. Sue received it in turn from her mother in Albion, Michigan, a bastion of rhubarb almost as strong as my own western Massachusetts. Their cake is excellent for supper or even for breakfast. The marshmallows (yes, marshmallows!) 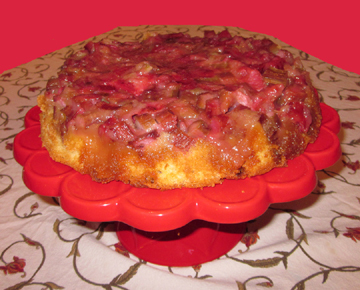 tone down the tartness of the rhubarb, and the cake is substantial without being over heavy. Before I get to the recipe, I’d like to remind readers that I have several other rhubarb recipes on this blog, including cole slaw, crumble, salsa, and soda. And then there’s the rhubarb baked Alaska…. Preheat the oven to 350 degrees. Generously grease a 10-inch iron skillet, and arrange the rhubarb pieces in the bottom. (If you don’t have a 10-inch skillet, use an 8- or 9-inch square baking pan.) Sprinkle the sugar on top, followed by the marshmallows. Bake the cake until a toothpick inserted into the center (but not too far down; don’t hit the rhubarb!) comes out clean, about 50 minutes. If the cake is brown but not done before this happens, decrease the oven temperature and continue baking. Allow the cake to cool for 5 to 10 minutes. Loosen the edges with a knife, and invert the cake onto a serving plate held over the skillet. Turn upside down. Remove skillet. Serve alone or with whipped cream. Serves 12. This entry was posted on Tuesday, June 1st, 2010 at 4:00 am	and is filed under Cakes, Pies, and Pastry, Rhubarb. You can follow any responses to this entry through the RSS 2.0 feed. You can leave a response, or trackback from your own site. Tinky, I have been one of your readers fortunate enough to have tasted many of your cakes in their original form, i.e., actually baked by you. The cakes have always been delicious. But this morning you’re asking us to take a significant leap of faith: marshmallows with rhubarb? Surely Dr. Tinky, you must be joking? After a lovely tribute to the rhubarb you love, and after a very appealing photograph of the finished upside-down cake, you show us the underbelly of the beast and it’s encrusted with marshmallows? Oh, dear. I’d like to suggest that this affront to rhubarb (your suggestion that the marshmallow tames the rhubarb’s tanginess notwithstanding) is akin to serving caviar with peanut butter. And, in a sense, rhubarb is the caviar of the fruit realm – a cultivated taste, perhaps, bursting not with the essence of the ocean but the garden instead. But… you may be right. So, in the spirit of culinary generosity, may we make a similar gesture to Midwestern culinary adaptations, thanking Michiganders for their inspiration, wondering perhaps whether they might have had mallow (an edible fruit, Genus Malva, family Malvaceae) in mind, and offering a New Englander spin on their cherished S’mores recipe: keep the Graham crackers and the marshmallow, but substitute rhubarb for the chocolate. That ought to dampen an infinite number of childhood campfires on the shores of the Great Lakes. Wow. 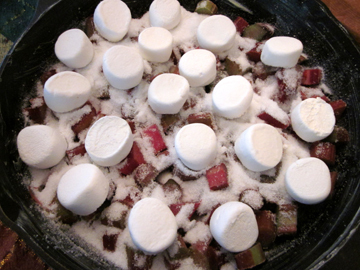 The mention of marshmallows with rhubarb seems to have touched a nerve with “Flaneur.” And the fact that the recipe came from Michigan… All I can recommend is that he/she try the recipe. The marshmallows provide a moist, vanilla-laced sweetness to the tart rhubarb. I’d like to see “Flaneur’s” favorite rhubarb dessert recipe…Is it served following a big bowl of clam chowder? This pie recipe is from a neighbor in Wisconsin back in the 70s. The cream and sugar make a rich, sweet contrast to the tartness of the rhubarb. My favorite way to eat this is straight out of the refrigerator for breakfast. Mix sugar and flour, add cream, and mix. Place rhubarb in prepared pie shell. Pour liquid mixture over rhubarb. Top with a lattice crust. Dan–Your pie looks amazing–and so simple! I’ll definitely try it (particularly the refrigerator part). Thank you. I actually haven’t made this pie in a while (though I’ve been dying for a slice); I need to find a rhubarb source closer than my in-laws in Maine. I did see some in a store the other day, but it was more than $4 a pound! I have never heard of such a thing but I think it sounds fantastic!! My husband will eat anything with marshmallows and I, too, am a huge rhubarb fan like yourself-Thanks! Tinky!!!! I made this yesterday and it was so yummy 🙂 Thanks for the recipe!!! I’m so glad, Vicky! It’s always nice to know I’m not imagining that recipes work……. I tasted my first rhubarb in a pie in Northern Idaho when I was twelve. The combination of sweet and sour was wonderful! This looks like a recipe worth trying too. I posted it to my Facebook and Twitter today. I love Rhubarb. A lot of people think I am nuts. Thanks for the tips.